Respiration, or cellular respiration, is an essential body function that involves the production of energy that cells use for energy. This function is classified into two types: aerobic and anaerobic respiration. Let’s learn the difference between the two. The term “aerobic” refers to an organism requiring air or oxygen to live. Thus, aerobic respiration is a process where cells break down food as it interacts with oxygen to create energy. This chemical process occurs in the mitochondria where glucose from food interacts with oxygen. This chemical reaction results in the creation of adenosine triphospate (or ATP) which the cells need to carry out active functions of the body. Water and carbon dioxide are byproducts of this process as well. Aerobic respiration is common in higher animal and plant forms. Aerobic respiration goes through three stages to produce ATP. The initial stage is called glycosis, which produces a small amount of energy. 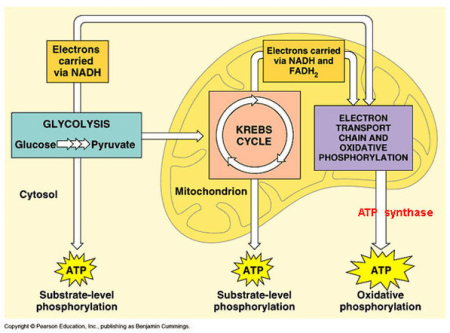 The second stage is the Krebs cycle, and is responsible for providing electrons and hydrogen to the last stage which is called the electron transport chain. The last stage is the most productive in terms of ATP production. Anaerobic respiration is the other form of respiration that takes place in the cells. While it makes use of glucose to create energy, it does not require oxygen. However, the amount of energy this process releases is considerably less than aerobic respiration. Anaerobic respiration is particularly useful in working muscles that do not have enough oxygen to produce the amount of energy they need. It starts to work when there is not enough oxygen for the cells to create energy. This usually occurs when the body is in active motion (e.g. running, exercising). Anaerobic respiration occurs in the cell cytoplasm, creating lactic acid as a waste product that gets stored in the muscle cell. However, the accumulation of lactic acid decreases a cell’s capacity to process the waste product. In the human body, this can result in muscle soreness and fatigue. Anaerobic respiration utilizes nitrates, manganese, iron, fumaric acid, sulfates, sulfur, and carbon dioxide in the absence of oxygen. Anaerobic respiration waste products such as lactic acid and ethanol are broken down once the body has enough oxygen to do so. This can only happen when the body breathes in more air and blood circulation improves, which in turn distributes oxygen to the cells. So what’s the difference between aerobic and anaerobic respiration? Both processes involve breaking down food to produce energy for the cells. However, aerobic respiration uses oxygen to do the job. When oxygen is not available, anaerobic respiration takes over to help the cells cope with the shortage. Aerobic respiration releases approximately 36-38 ATP molecules while anaerobic respiration produces 2-36. Aerobic respiration creates carbon dioxide and water as waste products. On the other hand, anaerobic processes create lactic acid and ethanol which still require oxygen for it to be completely broken down and washed from the the body. 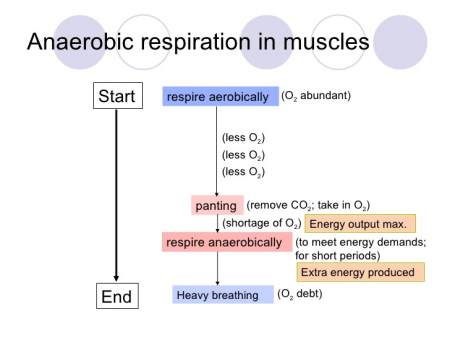 Check out this YouTube video differentiating aerobic and anaerobic respiration.